Amid the Pakistani Taliban, vicious Sunni sectarian groups prosper, galvanizing hatred of all minorities, Muslim and non-Muslim alike. The Ahmadi sect follows the teachings of a nineteenth-century religious reformer, promoting a peaceful variant of Islam. And yet in the 1970s, the Pakistani government declared the Ahmadis a non-Muslim minority and many Pakistanis today view them as heretics to Islam. On May 28 in Lahore, upwards of nine gunmen and suicide bombers blasted their way into two mosques and killed 90 Ahmadis, wounding another 110. The other minority groups, whether they be Shia, Christian, Hindu or Sikh, have lived in even greater fear since. The Christian community, which makes up less than 2 percent of the population, is already a target. In July 2009, eight Christians were burned alive in the small Punjab town of Gojra, and in riots that followed an entire Christian neighborhood was scorched. The 17 militants arrested for these crimes were not brought to trial, and the police, facing local pressure, later let them go. A year later, riots erupted again in Faisalabad, Punjab, after two Christians were killed while being held in police custody. Since then, any Christians who can have been seeking political asylum abroad in droves. An even-worse fate has befallen Shia Muslims. Prominent Shia technocrats—politicians, doctors, architects, bureaucrats and judges—have been singled out for assassination in all major cities, while in December 2009, 43 Shias were massacred by Sunni extremists in Karachi. Thus the Pakistani Taliban have a two-pronged offensive: the first is to politically undermine the state and its organs through terror; the second is to commit sectarian violence against all those they believe are not true Muslims. This intolerance has developed deep roots in Pakistan over the past three decades, and it has now been boosted by the jihadist policies of al-Qaeda and the Pakistani Taliban. The government’s inability to deal with sectarian threats has led to some Muslim groups arming themselves and taking the law into their own hands. This only leads to further loss of control by the state. AS ISLAMIC extremist violence spreads, the very fabric of the country is falling apart. Mapping how widespread and varied the violence is gives but a hint of the disaster facing Pakistani society. Growing poverty, inflation and unemployment have led to an unprecedented increase in suicides—sometimes of entire families. One hundred ninety-one people killed themselves in the first six months of this year; at more than one death a day, it is one of the highest rates in the world. And when 113 of those happen in the country’s richest province (Punjab), it is obvious not a single Pakistani is surviving this unscathed—no matter how seemingly privileged. Violence against women is also on the rise; 8,500 violent incidents took place last year. One thousand four hundred of those were murders. Another 680 were suicides. Freedom of information is quickly coming to a halt. Journalists receive regular threats if they do not report the statements of extremist groups, while extremist literature, newspapers and pamphlets continue to flood the market with no attempts by the state to stop them. And now leading electronics markets in major cities have been repeatedly bombed and shop owners warned to stop selling computers and TVs. Rather than combat the threat, the government has succumbed, closing down Facebook for three weeks starting in May and announcing that major web sites like Google and Yahoo will be censored for “anti-Islamic material.” This is shuttering a vibrant society and slowly turning a country that long strived for democratic openness into a closed state held hostage by radical Islam. Meanwhile, the lack of services is creating its own anarchy. In Karachi, with a population of 18 million, violence is so endemic and its perpetrators so diverse that it is difficult to summarize. What we do know is that beyond Islamic extremism, the city is in the grip of heavily armed mafias and criminal gangs, who kill over control of water supplies, public transport, land deals and the drug trade. Car theft is rampant. The most lucrative business is kidnapping for ransom. The independent Human Rights Commission of Pakistan reports that there were 260 targeted killings in Karachi in the first six months of this year, compared to 156 last year. Eight hundred eighty-nine murders were reported in the same period. Because the city is the melting pot of the country, much of the violence is between ethnic groups who live in virtual ghettoes and compete for the scarce resources of the city. Ethnic violence is translated into interparty political assassinations. The Muhajir-dominated Muttahida Qaumi Movement (MQM) which rules Karachi is made up of Urdu-speaking migrants from India. They are in a bloody war with an MQM offshoot and in intense rivalry with the largest Pashtun secular political group (the Awami National Party) as well as with the majority Sindhi population. The Muhajirs blame the Pashtuns for introducing the Taliban to Karachi, and ethnic killings are multiplying; party workers of all groups are being targeted. There is another civil war going on in Baluchistan Province between Baluch separatists and the army. A province long deprived of development, political freedom and revenue, this is the fifth insurgency by the Baluch tribes against the army since Pakistan’s founding. The ISI maintains that Indian agents based in Afghanistan and the Arabian Gulf states are arming and funding the Baluch. The insurgents launch ambushes and assassinations, and lay land mines every day. They have begun killing prominent non-Baluch who long ago settled in the province. School teachers, university professors and officials have proven the easiest targets—and this in a province that professes a literacy rate of only 37 percent (20 percent for women) compared to the national average of 54 percent. This summer Interior Minister Rehman Malik said that four separatist Baluch “armies” funded by India had forced 100,000 people to migrate from the province. Baluch militants killed 252 non-Baluch settlers from January to June of this year, also assassinating 13 army officers. The army in turn has brutalized Baluch society and several thousand young Baluch are said to be missing, presumed in prison and being tortured. The army’s insistence that the entire Baluch problem is caused by India and that the Baluch have no grievances of their own simply leads to further escalation of violence and further alienation of the population. The province erupted in days of riots and strikes after prominent Baluch nationalist leader Habib Jalib was gunned down in Quetta in mid-July. The local justice system in Pakistan is in dire straits. Policemen, judges and lawyers are frequently intimidated by terrorist groups. Evidence is rarely collected against the arrested perpetrators of attacks, and either the police or judges release the suspects. If not, the terrorists are quite capable of freeing their own by force from jails, courthouses and hospitals. After the Ahmadi killings, terrorists attacked a hospital where one of their arrested comrades was being treated under heavy police guard. In June, terrorists attacked a Karachi courthouse, freeing four members of their group undergoing trial for the earlier massacre of 43 Shias in the city. It is now a cliché to describe how a worsening economy and the lack of education and job opportunities have helped spawn Islamic extremism in Pakistan and elsewhere. Yet it is a trope worth repeating. 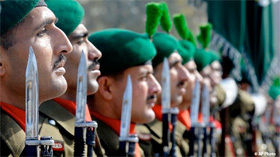 PAKISTAN’S GEOPOLITICAL assertiveness in the midst of all this chaos is a result of the military’s overwhelming power. It may be losing its hold on vast amounts of territory to the extremists, but it is taking control of Pakistan’s national security and foreign policy away from the government. As the country is now led by weak and widely considered to be incompetent and corrupt civilian rule with President Asif Ali Zardari, the husband of slain leader Benazir Bhutto, at the helm, the armed forces have found it relatively easy to carry out their own programs. Following its election, the ruling Pakistan Peoples Party (PPP) sought to reform the policies of the Musharraf era. This included improving relations with India, Iran and Afghanistan and ending Pakistan’s regional isolation. They failed. Zardari’s overtures regarding India were rebuffed, not only by New Delhi, but also by the Pakistan army—such civilian initiatives are considered an encroachment on military territory. And the November 2008 massacre in Mumbai by Pakistani extremists paralyzed engagement with India for nearly two years. India accuses the ISI of having a direct role in the massacre, which Pakistan denies. Yet Lashkar-e-Taiba, the militant group behind the massacre, has not been curbed. The situation in Afghanistan isn’t much better. Although Zardari improved personal relations with President Hamid Karzai, it had little impact on the army’s posture—an anti-Karzai, anti-ruling-government strategy. Only recently has the army decided that with a U.S. troop withdrawal starting next year, Karzai and the Afghan Taliban need to be brought together. The Afghan Taliban leadership has had sanctuary and support from the military since its retreat into Pakistan in 2001. Though former-President George W. Bush never attempted to tackle this conundrum, President Barack Obama has privately acknowledged what must be done, trying hard to bring Kabul and Islamabad together. Certainly, any recent success can’t be chalked up to the civilian leadership in Pakistan. The army says it wants to see a stable and peaceful Afghanistan after the U.S. withdrawal, and to that end it is trying to promote talks between Karzai and the various factions of the Taliban. However, many Afghans remain suspicious of an army that wants an Afghanistan free of Indian influence. Zardari and the PPP no longer make any moves that oppose the army’s foreign-policy aims. And over the past two years, a strident judiciary, at times backed by the military, has whittled away at the president’s power, trying repeatedly to undermine Zardari or force him to resign by resurrecting old corruption charges against him and by asserting its influence over the constitution—which is in fact Parliament’s prerogative. This judicial collision with parts of the government has further stymied the country’s reputation and put off aid donors and investors. It is destroying Pakistan’s democratic character. Making matters worse, the all-powerful General Ashfaq Parvez Kayani has just received a three-year extension to his term as army chief. It was a move that stunned the country. Many Pakistanis concluded that this further reduced the power of civilian authority. Political instability is precisely what Pakistan does not need. The country requires a sustained period of democracy under civilian governance—even if it is a bad, poorly functioning democracy. If Zardari is unpopular or ineffective, then he should be removed in the next election, not through a judicial or military coup. FOR DECADES, a cyclical pattern of military rule followed by its collapse and replacement by elected but weak civilian governments has occurred. In time, they too fall—often with a prod from the ISI—and the military returns. Repeated military rule has resulted in the decline of political parties, the exile or execution of civilian leaders, their lack of experience or knowledge when they do come to power, and the unwillingness of young professionals to get involved in politics. The political class has seen no new blood for a generation. The PPP suffers from all these problems and more. However, it remains the only national party in Pakistan, for it has support in all the provinces—Baluchistan, Sindh, Punjab and the former North-West Frontier (now called Khyber-Pakhtoonkhwa). Every other party, including the Pakistan Muslim League–N (the main opposition group), has degenerated. They are now nothing more than regional organizations representing local ethnicities or territories. Only the political alliance the PPP has forged in Parliament can claim to forward a national agenda; it includes regional parties belonging to all ethnic groups. If the government had the total support of the military and the judiciary, there would be a chance of greater stability and better policy options. Despite the severe problems it faces, the PPP has accrued some political successes in which lie hope for the future. After much delay and procrastination, Parliament passed the Eighteenth Amendment to the constitution in April 2010 that incorporates over 100 changes to the 1973 version of the document, virtually restoring it to its original form and doing away with authoritarian amendments made by successive military dictators. From having a de facto presidential form of government under military rule, Pakistan has now reverted back to having a parliamentary form of government with the elected PPP Prime Minister Yousaf Raza Gilani as the chief executive. The amendment also introduces a new judicial commission to choose judges for the higher courts (justified surely, but it has unsurprisingly angered the judiciary and further prolonged the conflict between it and the PPP). The amendment also grants an unprecedented degree of autonomy to the four provinces, increases decentralization, and brings many social subjects such as health care and education under provincial control for the first time. This has long been the demand of the three smaller provinces which have felt deprived by the concentration of wealth and power in Punjab. Now the government is giving an additional 10 percent of the federal tax take to the provinces under a new National Finance Commission Award. And Punjab made a rare sacrifice by giving part of its share to the poorer provinces. Over 70 percent of federal taxes now revert back to Baluchistan, Sindh, Punjab and Khyber-Pakhtoonkhwa. For the first time there is relative peace between the center and the periphery. In an effort to continue these steps toward stability, the PPP has moved to give greater autonomy to the northern areas abutting China. This is especially remarkable because they are part of the territory involved in the Kashmir dispute between Islamabad and New Delhi. Because of the areas’ proximity to India, Pakistan has exercised control over the region, which has never had self-government. That is now changing. What is still missing is a plan to bring the Federally Administered Tribal Areas (FATA)—the seven tribal agencies—into the mainstream of governance. Currently this territory has considerable autonomy from Islamabad; the government of the former North-West Frontier Province has no jurisdiction over FATA. Instead, the area is ruled by the president and laws drafted by the British during the Raj. This has led to a power vacuum that has produced a terrorist safe haven. Even though the army claims to have a counterterrorism strategy for the area, it is a plan that cannot work until the army is willing to accept a political agenda that brings FATA under the central government’s control. DESPITE THE incompetence of the government, the groundwork is now being laid for a genuine democratic dispensation through provincial autonomy, decentralization and the rebuilding of democratic institutions—theoretically making it more difficult for the army to seize power again. If these steps are matched with equivalent advances in restoring economic stability, reviving local and foreign investment, combating terrorism and Islamic extremism on a nationwide basis, and modernizing the judicial and police systems, Pakistan has a far brighter future than is currently portrayed. For now, a staggering foreign debt of $54 billion is crippling the country. An estimated growth rate of 4.1 percent for 2009–10 (a negligible improvement from last year’s 1.3 percent) means Pakistan is likely stuck in this financial quagmire. An energy crisis that leads to 14 hours a day of electricity cuts has crippled industry, farming and exports. The irresponsible handling of the economy is only deepening the crisis. This year’s $38 billion budget has seen a 30 percent increase in military expenditures from last year. This clearly leaves little money for health and education. With 28 percent of the funds reserved for servicing foreign debt, nearly 60 percent of the budget is taken up by that and defense. The entire development pool of $9.2 billion is provided by foreign donors. Pakistan needs financial aid desperately. Europe is extremely hostile to further bailouts of the country because it is well aware that the military is still spending more money arming itself against India than it is spending to fight the Taliban. On a recent trip to the European Union in Brussels, Prime Minister Gilani was sharply taken to task for his failure to provide good governance and greater transparency on how aid dollars are being utilized. It is to the credit of the current U.S. administration that it sees and understands that progress is being made, and is providing both financial aid and political support to deepen these changes. For the first time, under the Kerry-Lugar bill, there is U.S. aid that is specifically earmarked for civilian rebuilding rather than military spending. However, no real change is possible without a change taking place in the army’s obsessive mind-set regarding India, its determination to define and control national security, and its pursuit of an aggressive forward policy in the region rather than first fixing things at home. It is insufficient for the army to merely acknowledge that its past pursuit of foreign-policy goals through extremist proxies has proven so destructive; it is also necessary for the army to agree to a civilian-led peace process with India. Civilians must have a greater say in what constitutes national security. Until that happens, the army’s focus on the threat from New Delhi prevents it from truly acknowledging the problems it faces from extremism at home. The army’s track record shows that it cannot offer political or economic solutions for Pakistan. Indeed, the history of military regimes here shows that they only deepen economic and political problems, widen the social, ethnic and class divide, and alienate the country from international investment and aid. Today there is much greater awareness among the Pakistani people that extremism poses a severe threat to the country and their livelihoods. There is also a much greater acceptance that ultimately civilian rule is better than military or mullah dictatorship. What is still lacking in the war against extremism, however, is a consistent and powerful message from both the government and the army that they will combat all terrorists—not just those who threaten their security. Pakistan’s selective approach to extremism has to end before it can defeat the problem and move on to become what its founders originally intended it to be. Ahmed Rashid, a Pakistani journalist and writer, is the author most recently of Descent into Chaos: The U.S. and the Disaster in Pakistan, Afghanistan, and Central Asia (Penguin, 2009). His book Taliban: Militant Islam, Oil and Fundamentalism in Central Asia (Yale, 2010) has been updated and republished on the tenth anniversary of its original release.